How and why has foresight practice been turning towards design, media, arts and games –– and what does it mean for the future of futures? Plastic Century: interactive installation at California Academy of Sciences. Project by Stuart Candy, Jake Dunagan, Sarah Kornfeld and Wallace J Nichols, San Francisco 02010. Photo by Mike Estee. For futures studies to impact mainstream culture and contribute to civilisation-scale “social foresight” (Slaughter, 01996) it must be capable of bridging the “experiential gulf” between abstract possible futures, and life as it is directly apprehended in the embodied present. 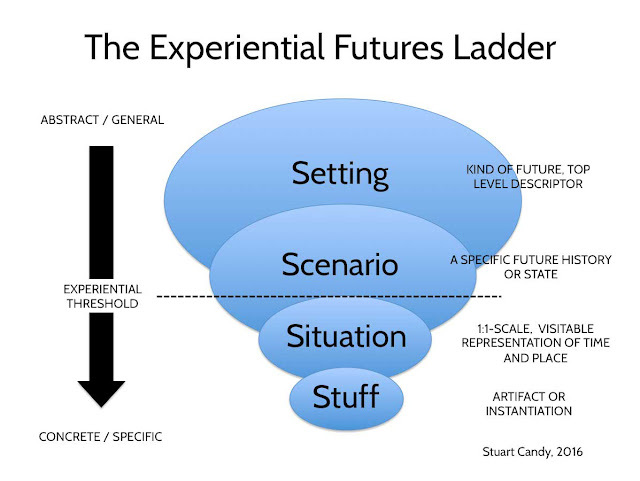 Enter experiential futures, the key motivation and rationale of which is to enable more effective foresight work, exploring and shaping change, by using the whole continuum of human experience as the palette of engagement. 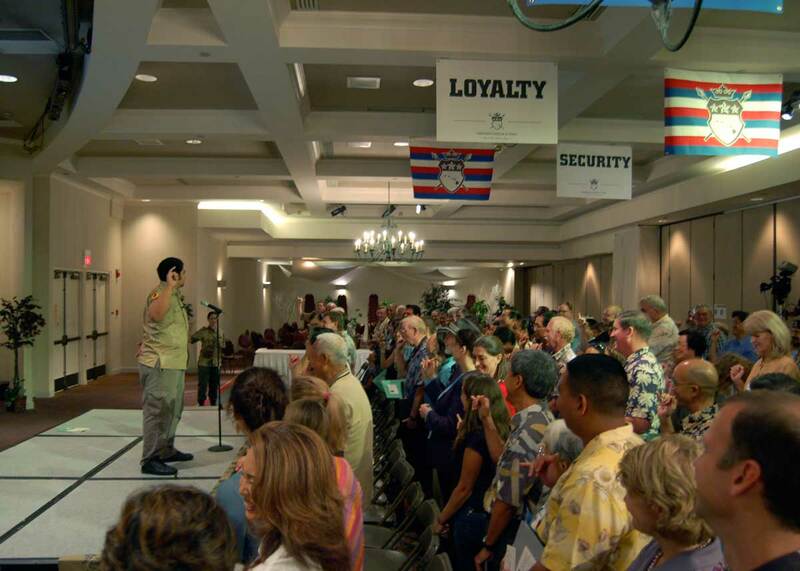 Hawaii 2050: public event kicking off a statewide sustainability planning process. Project by Stuart Candy and Jake Dunagan with Hawaii Research Center for Futures Studies and collaborators, Honolulu 02006. Photo by Cyrus Camp. 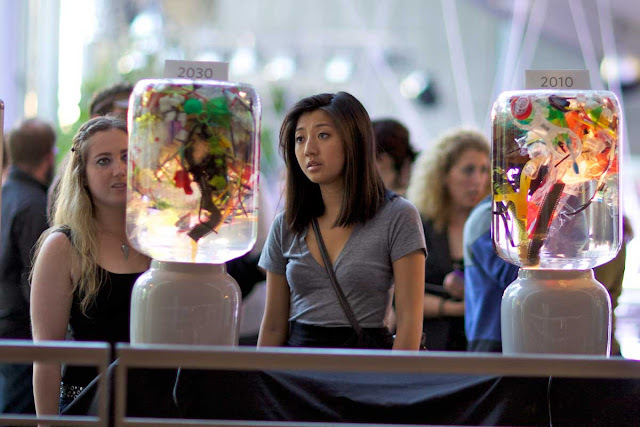 The origins and early cases of experiential futures are described in detail elsewhere (Candy, 02010), but to provide a sense of how far and how fast this area has developed over the past decade, and with growing numbers of other practitioners experimenting in these modes, the authors have worked on projects ranging from immersive experiential scenarios for a group of 550 people at a public policy-oriented sustainability event, to guerrilla street art campaigns, to national-level museums of future possibilities. Partnering organisations have included local, state, and federal governments, community groups, educational and cultural institutions, private enterprises, and nonprofits. We have also developed the practice through teaching in the world’s first two futures programs offered at design schools, at OCAD and CCA. The Experiential Futures Ladder: Most traditional futures practice, and certainly scholarship, operates on a high level of abstraction, above the experiential threshold, while experiential work explores more concrete manifestations of futures –– possible, probable and preferable. What then are some of the challenges for futurists making, or contemplating, an “experiential turn”? Enabling group thought and creative processes has been an important part of the futures field for years (Jungk and Mullert, 01987; Dator, 01993), and the stakes may be obvious to many already, but the affordances of group creativity and cognition using an experientially augmented toolset, and the details of what works best in what circumstances, are only now beginning to be worked out. Here, then, we offer some suggestions for core skills and sensibilities that need to be developed further; among them certain competencies already widely accepted and understood, alongside others that may be less familiar. 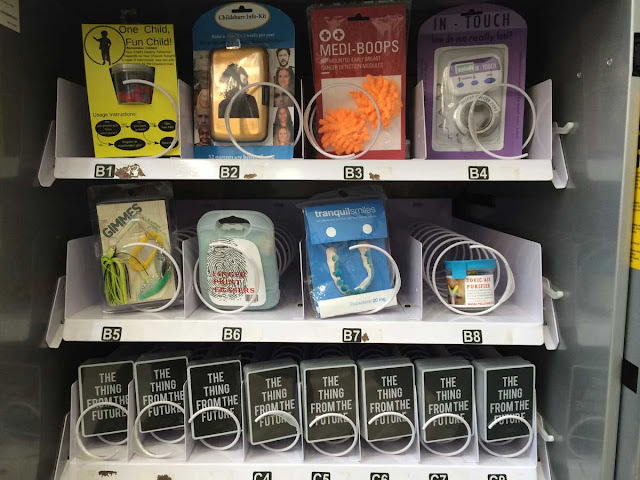 Futurematic Vending Machine: design jam at OCAD University to fill a vending machine with future artifacts created by participants. Project by Situation Lab and Extrapolation Factory, Toronto 02014. Photo by Stuart Candy. ● Become a student of the history, culture, and present situation of the places and people with whom you are co-creating – in order to empathise with and build upon their knowledge and experience. ● Become a perceptive mindreader – in order to understand the mental models of participants or audiences, and then decide how to expand or challenge those models. ● Become a flexible thinker with the habit of long-zooming and scale-toggling – in order to venture, with your transdisciplinary readiness to roam, wherever the inquiry may need to go. ● Become a master of situations – in order to facilitate the co-creative processes of groups, which includes recognising what to nail down, what to leave open, and when and how to improvise changes in response to the needs of the moment. ● Become an engineer of experiences, bridging the gap between the ground of present sensation and islands of abstract possibility – in order to be prepared to use whatever it takes to catalyse heightened creativity, thoughtfulness, engagement, and action, in yourself and others. ● Become a fastidious documentarian – in order to capture the materials, feedback, and insights created during what is a singular, often ephemeral, experience. ● Become a willing collaborator with others you meet along the way – in order to be poised to join forces with those who have skills that you don’t, since no social foresight can be accomplished alone. Time Machine CDMX: a student-created immersive scenario set in Mexico 02028. 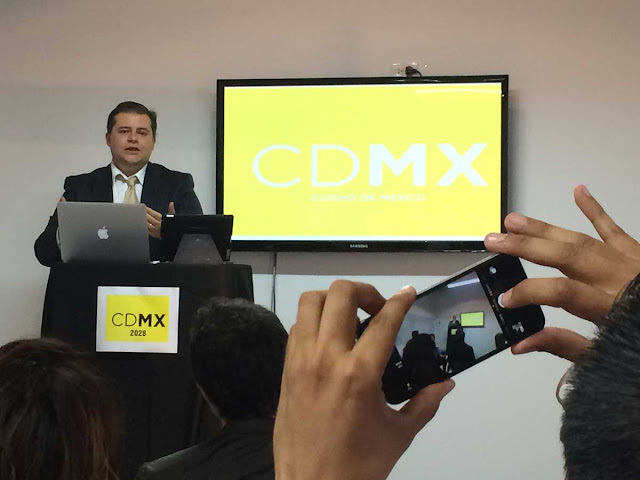 Class led by Stuart Candy and Jake Dunagan at CEDIM, Mexico City 02015. Photo by Stuart Candy. Overall, perhaps the central emerging challenge for foresight practitioners has less to do with generating and broadcasting ideas about the future than with designing circumstances or situations in which the collective intelligence and imagination of a community can come forth. To design and stage experiences of the future(s) is one class of activity. To attend to the design of processes whereby such experiences are designed, making scalable structures of participation, is another. Both frontiers must figure in the unending quest toward “a truly ‘integral’ approach to inquiry” (Voros, 02008). Finally, we emphasise that the outcome of all this is not simply to create interesting experiences; it is to make experiences that lead to the creation of better futures. To catalyse better futures is “the work” we futurists are called to do, and being willing to recognise the shortcomings of our existing conventions, as these become apparent, and to evolve towards new horizons in how we operate and cooperate––just as we urge and aspire to help our clients, audiences, students, and other constituencies to do––is a critical part of that duty. The original article from which this shorter piece comes (Candy and Dunagan, 02016) deals in detail with the blossoming romance between futures and design, including parallel areas of practice such as design fiction and speculative design. See Ramos, 02006, for an earlier articulation of this line of argument. A decade of experiential futures work can be regarded as a decisive turn in the field towards meeting this challenge. The tremendous influence of Jim Dator on this part, and in general, is gratefully acknowledged. See the section titled “To Be A Good Futurist” in Dator, 01996. Our list supplements rather than replaces that one; although note the shift in emphasis between there and here, from mastery of content, toward mastery of process, in service of group intelligence and creativity. • Candy, S. 02010. The Futures of Everyday Life [doctoral dissertation]. University of Hawaii at Manoa, Department of Political Science. • Candy, S. 02015. The Thing from the Future. In: Andrew Curry (Ed.). The APF Methods Anthology. London: Association of Professional Futurists. • Candy, S. and Dunagan, J. 02016. Designing an Experiential Scenario: The People Who Vanished. Futures (In press). • Dator, J. 01993. From Future Workshops to Envisioning Alternative Futures. Hawaii Research Center for Futures Studies. • Dator, J. 01996. Futures Studies as Applied Knowledge. In: Richard A. Slaughter (Ed.). New Thinking for a New Millennium. London: Routledge, p. 105-114. • Jungk, R. and Mullert, N. 01987. Future Workshops: How to Create Desirable Futures. London: Institute for Social Inventions. • Ramos, J. 02006. Consciousness, culture and the communication of foresight. Futures, 38(9): 1119-1124. • Slaughter, R. A. 01996. Futures Studies: From Individual to Social Capacity. Futures, 28(8): 751-762. • Voros, J. 02008. Integral Futures: An approach to futures inquiry. Futures, 40(2): 190-201. The full text of this piece can be found in pdf here. It appears in the inaugural issue of Human Futures (December 02016), a publication of the World Futures Studies Federation. The piece represents an edited excerpt (about 10%) of a full-length article and case study of an experiential futures project we did at Arizona State University’s inaugural Emerge festival. That article – excerpted previously at The Sceptical Futuryst here – appears in a special issue of the journal Futures on the theme of Experiencing Futures, guest edited by Cornelia Daheim and Kerstin Cuhls. Update 01aug17: Our original article from Futures has been named a 02017 Most Significant Futures Work at the annual Association of Professional Futurists (APF) Awards, in the Advancing Methods and Practice category. We are grateful to the APF and jury for this honour. Hey Stuart. This blogpost was just what I needed to finish off my year. It has given me some good food for thought and I really appreciate the greater links to design. Thanks for the links and examples. It must be time you came back to Christchurch! Thanks, very glad to hear that – and yes would love to come back and learn about the latest goings-on in ChCh!